This mountain is located on the border between Germany and Austria. If you travel on the autobahn from Munich to Salzburg, then exit south towards Inzell shortly before Salzburg. Drive through Inzell and continue south following signs for Lofer. You will enter Austria (on Hwy. 178), then arrive at the small town of Unken. In the middle of Unken, make a right at the road signed for Heutal. Measure from here. Drive uphill in hairpin curves, then enter a flat area with pretty large pastures. At kilometer 7.5, you should have a small building on your right with many different information signs posted. Turn right immediately before this building. Drive 300 meter. There is a signed parking area, P2, on your left hans side. Note that this is a self-serve pay parking. Park here, this is location N47.66248, E012.66434, elevation around 1005 meter. From the parking, continue uphill on the narrow, paved road. At a fork, where the paved road curves left, continue more straight on a dirt road. Follow this road until it crosses the creek, there is a black metal gate here. Leave the road, stay on the left side of the creek and continue uphill, now on a trail. Follow this trail, there is a (small) fence that must be crossed higher up, do not take a smaller trail that turns left (uphill) here. 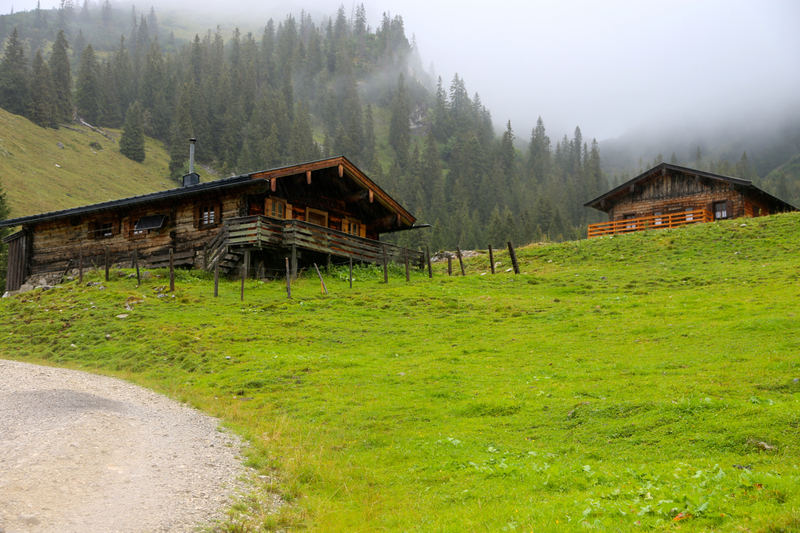 The trail will cross a forest road and continue uphill across some pasture, passing a few mountain farm buildings. After a short section of forest, you arrive at Hochalm. Follow the road as it curves uphill while passing several mountain farm buildings. On the upper side of the buildings, fork left (uphill) on a signed trail for Sonntagshorn, where the road bends more right. This trail climbs to a second (signed) fork where Sonntagshorn is again left. The trail now climbs the mostly grassy hillside in big zig-zags, also crossing a few (farmers) fences. The path finally hits the main summit ridge in a right curve. The last, short section is now uphill along the ridge to the summit cross. 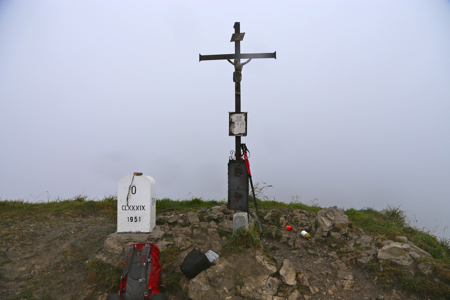 The summit also has a small white border pillar marking the boundary between Germany and Austria. I had arrived from Norway via Munich the day before. My original plan had been to fly to Vienna, however a bird-stike (in the jet engine) of my flight led to cancellations and my best option was to reroute to Munich. I located a very convenient and inexpensive B&B place in Unken, called Binderschuster, (phone +43 699 17235436) located at N47.64261 , E12.72593. In fact, the best way to find this place is to take the second exit for Heutal, it is then the first house on your left hand side. I had breakfast at 0600, then left for Heutal. I started hiking at 0710. The weather was definitely not nice. It rained, not a little, but a lot. I arrived at the summit at 0855, soaking wet. It was cold and a bit windy, I needed to put on my gloves. No hospitable place and no views, I started back down at 0905 and came to my car by 1030. All my clothes in the backback were wet as well, I drove to Unken and got myself a small lunch and some plastic bags to protect against the water. All my Euro bills were soaked as well. I sat in the car with the heater at full blast and Euros spread all across the area next to the windshield. A few passing pedestrians clearly noticed my money laundering operation. Next, I drove to Lofer in order to prepare for my climb of Grosses Ochsenhorn.